If you are a Singaporean and love moist and fudgy chocolate cakes, you might have known Lana Cakes. Do you? Located in 36 Greenwood Avenue in Singapore, Lana Cake Shop is an old school bakery famous for its ultra moist chocolate cakes which are also nicely frosted with thick, smooth, shiny, dark and fudgy chocolate frosting. Many chocolate cake lovers said that the Lana's chocolate cakes are like the Awfully Chocolate chocolate cake. Hmmm... kind of but I can detect the slight difference in them. To me, Lana's cake is fluffier in texture and lighter in taste and its chocolate fudge frosting is rather old school with a hint of jelly-like of texture. Whereas, AC's is more modern with denser and more fudgy texture and also stronger chocolaty taste. You think? Based on this article that was published in Feb 2016, Mrs Violet Kwan, the owner of Lana cake shop said that she is retiring. Since 1964, she has been selling about 100 cakes a day, mostly chocolate ones and she is looking for a successor. I sincerely hope that she can find someone that will cherish her shop and also famous recipe because I really wish that her legacy won't vanish into nothing once she stopped baking! Have I been eating Lana's chocolate cakes? Yes and heaps!!! I was the fat kid who often requested my father to buy the Lana's cakes for our birthdays or any celebrations and whenever I suggested Lana's cakes, there was always no objection. Speaking of Lana's cakes now, I feel like drooling again... Gosh! You might ask... If Lana's chocolate cake is so popular, there must be a copycat Lana chocolate cake recipe and you are absolutely right!!! 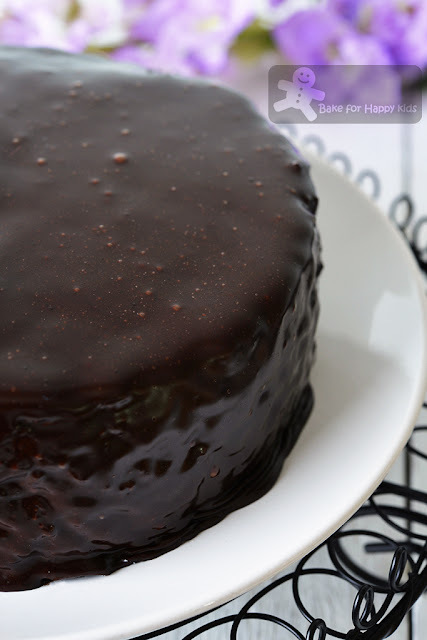 If you search "lana cake recipe" at Google, you will find several different chocolate cake recipes and one of them is this popular steamed chocolate cake recipe by Cookie Fleur and this similar steamed chocolate cake recipe can be found at here and here. 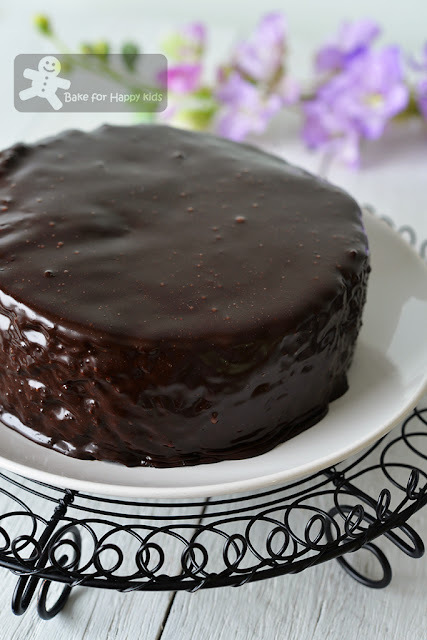 True enough... this heavenly steamed chocolate cake is ultra moist, fudgy and delicious but is it similar to Lana's chocolate cake? Say that I'm fussy or critical because I would say that this moist chocolate cake is only 70% like Lana's all because it is an ultra moist chocolate cake. Please don't get me wrong... This cake is very delicious but I have to honestly say that it is not 100% Lana's!!! Next, I'm deducing 10% because this cake is way too dense and fudgy. I remember Lana's cake is a little fluffier in its texture and I reckon this one is more like Awfully Chocolate's. Last, I'm deducing another 10% because this cake is way too rich in its taste. Remember that I have said that Lana's cake is old school? Yeah because most old school cakes aren't as rich like this kind of cake. On second though, do think that Lana chocolate cake is better than this cake? You know what? Both can fight!!! ... because both are good in their different ways. Lana = nostalgic and this cake is not! This cake = luscious and indulging and Lana is more humble and homely! Whether this chocolate cake is more or less like Lana's, I'm happy that I have made this heavenly moist cake. Plus I had learned something valuable here that I can't help to suspect that the moist chocolate cake like Lana's cake might be actually steamed!!!??? You think? No one except Mrs Violet Kwan knows... LOL! Me no Mrs Violet Kwan and so this is how I steamed this cake... LOL! 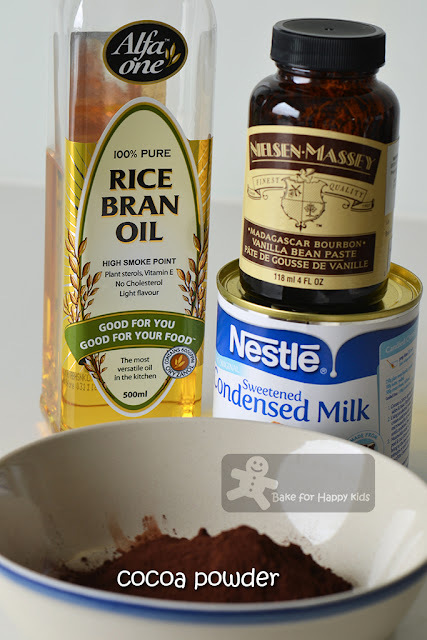 Instead of butter, I have used rice bran oil to make this cake. There won't much difference if you use butter but butter will make the cake richer with more milky taste. And I steamed the cake! So easy!!! Remove cake from the pan and allow it to cool completely on a wire rack. While the cake is cooling, I made the chocolate glaze. 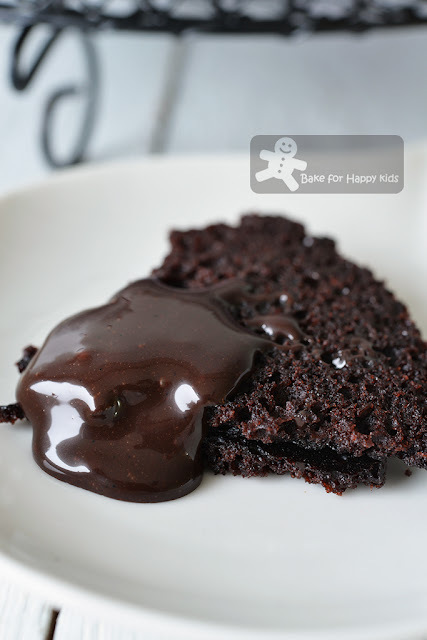 This chocolate glaze is so runny that I don't even call it a frosting! Ingredients to make the glaze. Combine all and cook until it reaches its smooth and thick consistency. Coat the cake with the glaze. Transfer into a serving plate and chill until the glaze is slightly firm. Sorry that I don't have a picture showing a slice of this cake as I have made this for a birthday celebration. Having said that, I still have something to show you... and it is a picture of some delicious "waste" that I enjoyed after I assembled this cake. This is a piece of the trimmed cake top that is served with some leftover glaze. Not so glam but yet still so heavenly! Want something more like Lana Cake? It can be a new mission for me to pursue but I'm actually quite happy with this steamed chocolate cake recipe at this moment. Grease the inside of your cake pan by brushing a coating of oil and line the bottom of the pan with a piece of baking paper. Set up a large steamer with boiling water. 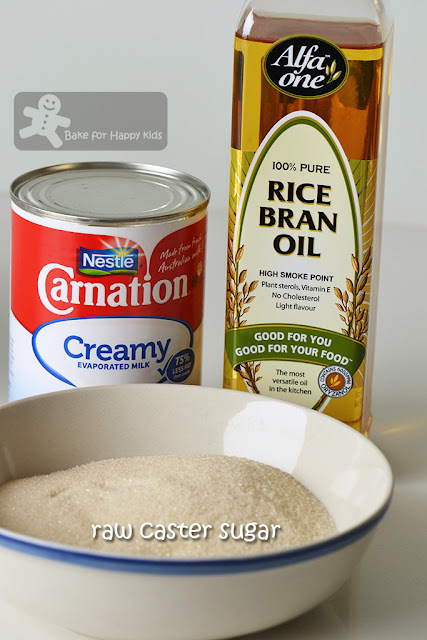 Add oil, sugar and evaporated milk in a large saucepan. Place the saucepan over a low heat and use a hand whisk to whisk mixture while cooking until sugar is completely dissolved and mixture is smooth. Remove saucepan from the heat. Allow mixture to cool until it is nearly like room temperature or cool enough to touch. 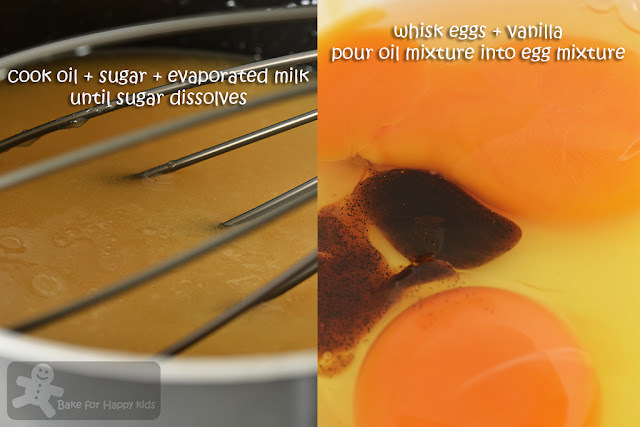 Add eggs and vanilla into the oil mixture and whisk until combined. In another bowl, combine flour, cocoa powder, baking powder, baking soda and salt. Sift flour mixture into the oil mixture and whisk until all are just combined. Do not over mix. Please note that the cake batter will be runny. Pour batter into the prepared pan and place the pan into the steamer. Cover pan with a large piece of baking paper so that the water vapour from the steam won't wet the cake batter. Steam with medium low heat for 90 mins or until a skewer inserted comes out clean. Remove the cake from the steamer and allow it to cool completely in the pan before removing it onto a wire rack. It is important to wait for the cake to cool completely before pouring the glaze on it. 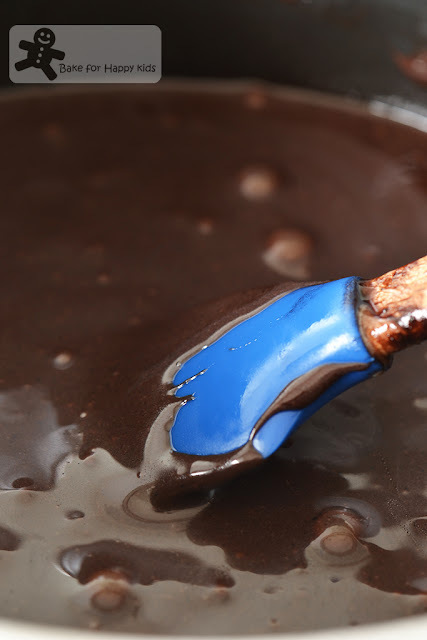 Place cocoa powder, condensed milk, oil and salt in a saucepan and place the saucepan over a low heat. Keep stirring or whisking while cooking the mixture until it is smooth and shiny. Important: Do not boil mixture!!! Once ready, remove saucepan from the heat. Stir in vanilla and allow mixture to cool to a stage when it is still gooey and not too stiff to coat the cake. 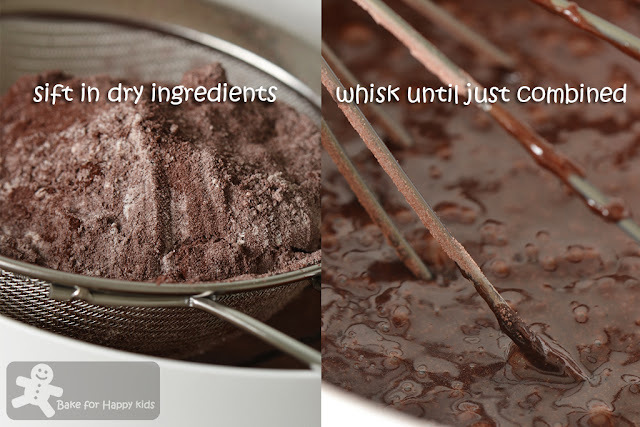 If mixture is too stiff to use, warm it up a little until it reaches its ideal consistency. Use a serrated knife to trim the dome top of the cake into a flat top. Place cake on a wire rack with a lined tray placed at the bottom of the rack to collect any excessive glaze. 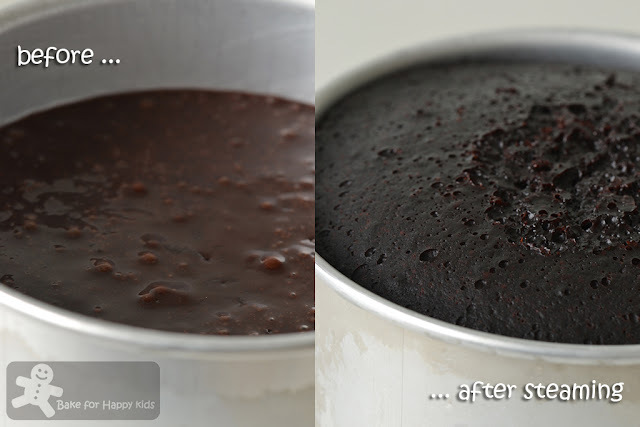 Pour glaze to coat the cake and use a spatula to coat the glaze at the side of the cake. The cake is not coated enough? Collect the excessive glaze and reuse it by pouring onto the cake again until the cake is well coated with a good amount of glaze. If the glaze is too stiff to use, warm it up a little until it is smooth and gooey again. Allow the glaze to set slightly onto the cake at room temperature for about 30 mins. Transfer cake onto a serving plate and chill the cake until the glaze is set enough. Store any uneaten in the fridge in airtight container for up to 5 days and you will surprise that it is still moist!!! How much butter if not using oil? Same amount of the oil. 180g butter replace 180ml oil. ooooh yumm , have to take down the address of this Lana cake shop then, we might be heading to singapore end of this year, hubby hinted he might have a conference so hoping to tag along. 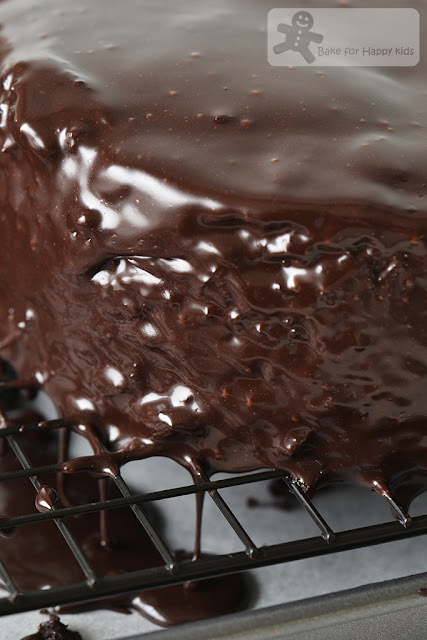 This chocolatey cake with gooey cocoa glaze really look so tempting ! I'll just a have mounthful ... hee .. hee..
Really enjoy reading your blog. Hi, can this be made into a 4 layers cake and frosted with Italian meringue buttercream? I have not try using this recipe to make layer cake before and can't tell if it is going to work or not. This cake is very moist and fudgy and might be difficult for you to cut into 4 equal layers and I reckon the cake base might too heavy to be placed on any silky buttercream but if you want to try, please do. Swooonn......Zoe, I am on a diet but I am starting to change my mind LOL! How long do I need to steam my cake if I'm using a 23cm cake pan? Hi Leng, Sorry that I have not tried steaming this cake with such a large cake pan to steam this recipe into a very shallow cake and won't know the best timing to steam it. Depending on the steaming heat that you used, the best thing to do is to keep checking and steam until a skewer inserted comes out clean. Cheers! Hi, can I use self raising cake flour to replace all purpose flour? SR cake flour and all purpose flour are both very different flour. I have not try making this cake with SR flour without the baking powder and soda and so I can't comment further to say whether it will work or not. Sorry! Will attempt this for my mum's birthday !!!! Thank you for sharing the detailed recipe. I have followed it closely! My neighbour commented the texture was good and soft! I have only tested out the cake, glaze will be next experiment. Any suggestion why my cake has many holes on the surface? Is it because I open the lid of the steamer 2-3 times to check if water is sufficient? Hi Ai Ling, The big holes on and in the cake might be caused by 1) over-mixing and the gluten get toughened after over-working or 2) the baking powder and soda are not mixed into the batter thoroughly. To avoid this, you can give your filled cake pan a gentle tap before steaming it. And, don't over-mix the batter and must sift in the dry ingredients. Cheers! Thank you for your suggestions. Will do so in experiment number 2! Hi Zoe,I just made this and love it! I credited the recipe to your site, on Instagram but somehow it doesn't show up as a link. Thank you anyway... what an awesome recipe! 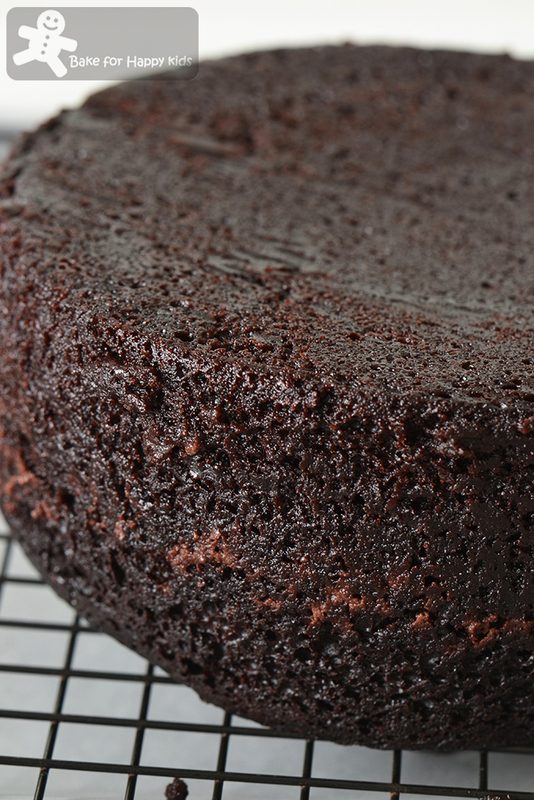 Not too sweet, yet chocolatey and has how old-school texture!